Composer Dave Maric and percussionist Cameron Leach rehearse in Capital University's Mees Hall Auditorium. Two brand-new musical works – involving cutting-edge technology and offering commentary on subjects as diverse as a brassy night in Vegas and the wild and woolly world of social media – will receive their world premieres in Columbus this weekend, as Capital University’s Conservatory of Music celebrates its 100th anniversary. Chicago composer and Capital University Conservatory alumnus Mat Morse’s chamber work Eternity Dwells (between the Mirage and Casino Royale) and U.K. composer Dave Maric’s Spiel for solo percussion, electronics and wind ensemble will be performed during the conservatory’s 100 Years of Music Gala Concert Celebration, Friday, March 29 and Saturday, March 30 at 7:30 p.m. in Capital University’s Mees Hall Auditorium. Columbus percussionist and conservatory alumnus Cameron Leach will perform as percussion soloist with the Capital University Symphonic Winds in Maric’s Spiel, and members of the Symphonic Winds will also perform Morse’s Eternity Dwells. Students and faculty in the conservatory’s music technology program will deliver pre-recorded musical effects for each work. The Capital University Conservatory of Music commissioned both works in celebration of its 100th-anniversary gala concerts, which also feature noted composer Eric Whitacre and Capital University director of choral activities Lynda Hasseler leading the Capital University Chapel Choir, Choral Union and Chapel Choir Alumni. Classical 101's Jennifer Hambrick interviews Eric Whitacre and Lynda Hasseler ahead of the gala. Plus, Whitacre shares what he's working on next. Sense impressions from a late-night walk down Las Vegas Boulevard were Morse’s inspiration for Eternity Dwells (between the Mirage and Casino Royale). Musicians from the Symphonic Winds will perform live Friday and Saturday night, synchronized with 40 additional audio tracks by Morse – including sounds like electrical generators revving up, licks played on the harp and rhythmic loops performed on the traditional Chinese erhu and the Middle Eastern oud. The structure, or “blueprint,” as Maric calls it, of Spiel comes from Maric’s own observations about how people interact on social media. 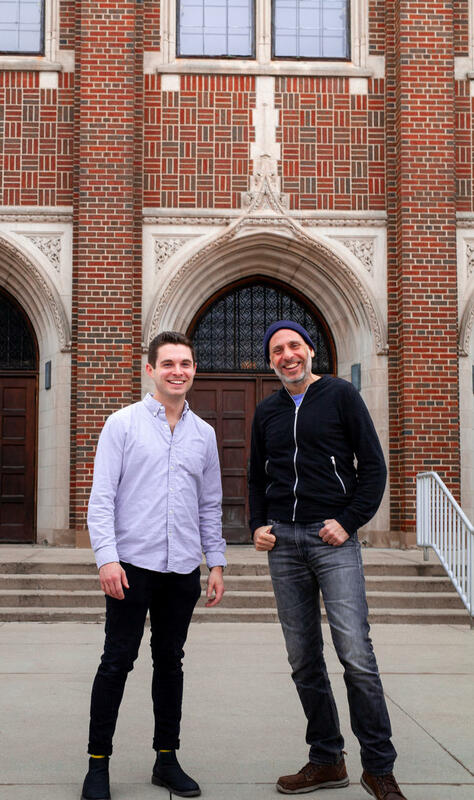 Percussionist Cameron Leach and composer Dave Maric stand in front of Capital University's Conservatory of Music. The work’s title – Spiel – is the German word for “game” and the Yiddish word for a story that’s potentially over-the-top or annoying. All of these meanings come into play – pun intended – in Maric’s piece. “You could look at Spiel as a game,” Maric wrote, “or a gladiatorial battle, or the over-amplified emotions that play out when those who express their ‘passionate’ opinions publicly spiral out of control into emotionally fractured territory. That chaos can be both seen and heard in Spiel. The concerto calls for Leach to move back and forth among three different percussion stations and to play on a large and eclectic battery of instruments, including marimba, snare drum, vibraphone, glass wind chimes, various sizes of gong, seed pods and temple blocks – to name only a few. Watch Cameron Leach's 2018 performance in the Classical 101 studio. And in a subtle way, Spiel is even a commentary on the power social media seems to have over us. To find out whether Spiel implodes like most social media spats seem to, you’ve got to enter the fray. The world premieres of Mat Morse’s Eternity Dwells (between the Mirage and Casino Royale) and Dave Maric’s Spiel will take place during the Capital University’s 100 Years of Music Gala Concert Celebration concerts, Friday, March 29 and Saturday, March 30 at 7:30 p.m. in Capital University’s Mees Hall Auditorium.